Young International Mediation Competition is one of the most prestigious Mediation competitions around the world. It was organized by Vis East Moot Foundation Ltd and supported by the Hong Kong International Arbitration Centre (HKIAC). It was held from 2nd to 8th August 2015 in Hong Kong. YIMC is a multi-faceted educational programme that includes both instruction and a competition through which students can demonstrate their mastery of the various skills used in mediation. An active social program throughout the week of the competition in Hong Kong promotes the establishment of long-term friendships and connections. 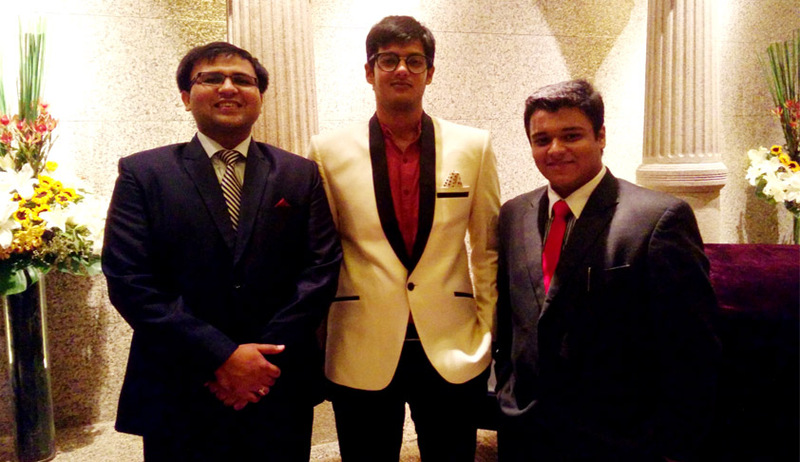 The team comprising Aishwarye Dubey (5th year), Abhay Sharma (4th year) and Yash Vardhan Bhotica (3rd year) of NATIONAL LAW UNIVERSITY, ODISHA (INDIA) have been adjudged as Winners (First Place) of the Best Mediation Representation Plan at the Young International Mediation Competition, 2015. Team: We feel extremely happy after achieving this feat and, we are thankful to all those who made it possible for us to compete in such a prestigious competition. Furthermore, we are delighted by the fact that our efforts paid off in the end. LiveLaw: What was your motivation behind opting for the reason behind doing this Mediation competition? Why did you decide to do this competition? Team: The sole reason that motivated us to participate in such a prestigious tournament was that, we wanted to explore new opportunities of competition and exposure outside India. We have participated in certain prestigious ADR competitions in India and therefore, we wanted to raise the bar this time and try to bring laurels to the name of our Institution on an international platform. LiveLaw: What difference did you find at Young International Mediation Competition and other Mediation competitions? Team: One of the striking differences that we could figure out between the Young International Mediation Competition and other Mediation/ADR competitions was that, the quality of professional training that was imparted to the participants before the commencement of the competition was of a very high standard. There were renowned professional Mediators, which imparted the training to us and they made the training session quite interactive. In those sessions, we met and broke-the-ice with people from different parts of the world and by the end of the session, the camaraderie between the participants was really heartwarming. LiveLaw: What is the most important thing you learnt while preparing and competing in this mediation competition? Team: The most important thing that we learnt was that, this competition requires tremendous amount of teamwork and it can never be a one-man-show. The dedication required to compete in this competition must come from all the team members and it should remain consistent till the end. LiveLaw: What was the toughest part while preparing and competing? Team: The toughest part while preparing for the competition was the communication gap that crept up between us. All three of us were interning in different cities in the months of May & June and it became really difficult to co-ordinate our preparation for the competition. Moreover, while competing we realized that we were up against professionals who had years of experience behind them in the field of Mediation. Therefore, maintaining our poise and demeanor before them, as well as in front of the Judges, was a tough job. Team: We suppose none of us, at any point of time, did feel like giving up. However, there were times when we were literally exhausted by the preparation. In those times, we took a sabbatical of one-two days just to calm down our nerves and begin afresh because, constantly doing the same thing for a long period of time can exhaust even the best. So, we used to shut down our laptops and books, and just relax for a day or two. Team: To tell you the truth, fate brought us together. We are students of different batches and so, interaction amongst us three was never really too much. So, all we can say is that we thank our stars for bringing us together. Team: In our team, the role and work of each member was divided from the beginning itself. Aishwarye Dubey carried out the role and work of the Mediator while the role & work of the Client was done by Yash and the Counsel’s job was that of Abhay’s. Team: We would like to extend our heartfelt gratitude to Professor Nachiketa Mittal for his valuable inputs as they proved to be instrumental in accomplishing our task. LiveLaw: How many National and International Mediation Competition have you guys participated in and won? Team: One of our teammates (Aishwarye Dubey) has participated in various National & International Mediation Competitions. He was adjudged the “Best Mediator” in the Finals of the Mediation Competition of the NLS ADR Tournament 2015 and, he was part of the University Team that participated in the NLIU-INADR International Law School Mediation Competition 2014. Team: We haven’t really decided as to the area of law in which we would like to gain expertise in but, one thing is for sure that Mediation and other Alternative Dispute Resolution processes are something which we would like to keep in our mind while taking a call on the area of law in which we would gain expertise. LiveLaw: How did you balance your academic performance or internship with the preparation of the Mediation Competition? Team: It was a hectic task for us to balance our studies and internships with the preparation. However, our parents and friends provided the much needed support at the right time and the rest of the path was not that difficult to tread. Team: As we have already said, we are still unsure as to what we wish after law school gets over. So, if we work in the right manner with the right motivation and dedication, we would surely do something worthwhile after these 5 years. Team: We are a good team, in our opinion but, we also, like any other team, had some minor tiffs with each other in the initial stages of preparation phase. Gradually, as we started to work and know about each other, we understood that we have to mould ourselves as per the circumstances. Eventually, by the end of the competition, the camaraderie between us was amazing. Forte- We know our job pretty clear-cut and we know we are good at it. Therefore, we did not lose our cool even if we were pitted against a tough opponent. Roadblocks-The communication gap which cropped up in the initial stages of preparation. LiveLaw: Which area of law was the question based on? Team: The Question was based on the United Nations Convention on the Contracts for the International Sale of Goods (CISG). LiveLaw: Which team would you consider to be your toughest competitor? Team: In our opinion, the toughest competitor that we faced was Edith Cowan University (Australia). Team: In the Young International Mediation Competition, a lot depended on as to how we presented what we had written in our Mediation Representation Plans. Presentation Skills play a vital role in deciding who gets the top spot. Therefore, we tried our level best to present our case in the most lucid and articulate manner. LiveLaw: Any tips you would like to give for the students who are planning to go Young International Mediation Competition in the coming years? Team: Three Things we would like to say to the students – Firstly, Be thorough with your research on the CISG. Secondly- Practise Mock Mediation Rounds with your peers and friends so that you get a good understanding as to the Role of the Mediator, Client & Counsel. Lastly- Always Improvise when you are practicing Mock Mediation Rounds because flexibility and creativity are the keys to success in a Mediation Competition. LiveLaw: Is Mediation a good process for dispute settlement as compare to arbitration ? If yes then why ? Team: Yes, Mediation is a better means of dispute resolution because Mediation helps the parties take control of the outcome of their dispute. They decide what they want out of this process and they can, in an informal manner, express and let off things from their chest that is essential for the resolution of their dispute. LiveLaw: What do you think about the Mediation in India and what methods should be adopted that parties engage in Mediation to settle their dispute? Team: Mediation in India should be institutionalized and the Courts should frequently use Mediation as a tool to lessen the burden of litigation on their shoulders. It should be openly advocated as a means of dispute resolution and we believe that it is yet to receive its due share of acknowledgement and appreciation as a quick and cost effective means of Dispute Resolution. LiveLaw: What message would you like to pass on to the mediators and the non-mediators out there? What is your advice to someone who has never been into mediation before? Team: Our advice would be that, all of us need the right kind of guidance to choose our calling in life. Therefore, before venturing into the field of Arbitration/Mediation, do a background check as to how it is conducted, how it is beneficial to you and so on and so forth. Essentially, weigh the pros & cons before venturing into ADR competitions. And above all, do the thing which appeals to you the most-it might be the path less travelled but, the best journeys are the ones which are full of surprises.